The Residence du Lion d'Or Louvre offers elegantly furnished studios and apartments fully-equipped to offer maximum comfort and amenities and most importantly, to make your life easier, so that you feel just like home. Available in four categories, they can accommodate 2 to 4 people. Most studios and apartments are characterized by real wooded beams which embellish the interior decoration. Some of them have a mezzanine, both practical and trendy. The entrance to the residence is fully secure and each apartment features a safe to protect your valuable belongings. You will benefit from optimum comfort in peace and independence. The Residence du Lion d'Or Louvre offers 10 elegantly furnished non-smoking studios and apartments, fully-equipped to offer maximum comfort and amenities and most importantly, to make your life easier, so that you feel just like home. Available in four categories, they can accommodate 2 to 4 people. The central location of the residence in the heart of Paris and near the most famous monuments, is really an asset. With its listed buildings, the rue de la Sourdière alone is an exceptional place, which deserves some attention and strolls. 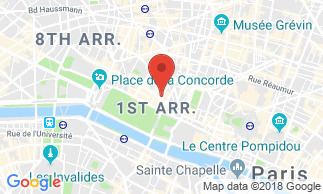 From the residence, located in the first arrondissement of Paris, you can access within minutes the Rue de Rivoli and the Tuileries Garden, the Royal Palace, the Louvre Museum or the Opera Garnier and also take different means of transport - metro, bus, bike - which allow you to easily reach all parts of Paris.